International Master Christof Sielecki's long-awaited new book utilising Chessable's unique video-sync technology is here. 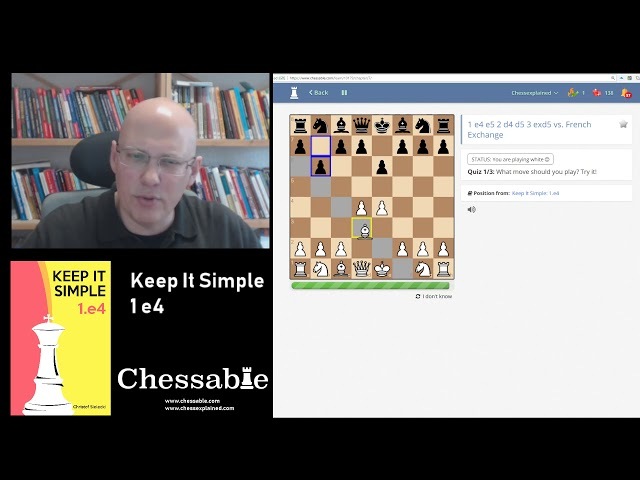 Keep It Simple: 1.e4 does exactly what it says on the tin - it is an easy-to-learn, precise and systematic look at how White can topple every defence at Black's disposal. But this Chessable first is far more than a chess e-book. Included are a total of 17 hours of instructional video synced with 700 MoveTrainer™ variations allowing you to watch, read and practise at the same time. IM Sielecki is, of course, no stranger to video chess instruction. His popular YouTube channel Chessexplained now has nearly 30,000 subscribers. Here he presents a super-solid set of carefully chosen lines to equip players at all levels with tools to dominate Black in the opening. IM Sielecki's main recommendation for dealing with the main line of 1.e4 e5 2.Nf3 Nc6 is based on the Scotch Four Knights which follows with 3. Nc3 and aiming for d4 to get an advantage in the opening. The author also presents reliable systems to keep the pressure on Black's every try. Three chapters are devoted to the Sicilian, plus systems against the Caro-Kann, the French, the Pirc, Modern and Philidor and ways to counter the Scandinavian, the Alekhine and other rare lines. This exclusive book is the first of a new generation of Chessable video-sync e-books and it is brought to you by one of the best video teachers out there. 4.9 out of 5 stars, based on 192 user ratings.